WorldClassRoom FAQs - How can I view comments from instructors on my assignments? 1. Click Assignments on the left sidebar of your course home page. 2. Click the title of the assignment for which you would like to view feedback/comments. 3. Click the Submission Details link. 4. 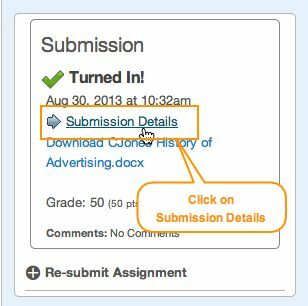 Click the Preview icon to see details of your assignment submission. 5. A preview of your graded assignment will appear. You can view in-text comments and feedback directly on the assignment (left), and see overall comments and feedback from your instructor (right).